Ash Davis with a shot on goal for Whitley Bay. Two goals inside the first 14 minutes saw Seaham Red Star take all three points from Hillheads on Saturday. And the defeat came about through what was by far the poorest performance from Whitley Bay since Ian Chandler returned as manager. In marked contrast to their previous game, a stunning 5-1 victory over Dunston UTS, this was a disjointed display with passes going astray and a lack of cutting edge. 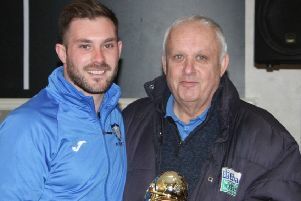 Seaham came into the game on a good run of form and included no fewer than six former Bay players in their squad, most notably triple FA Vase winner Lee Kerr. Meanwhile the home side were without three key defenders, captain Michael Laws and Callum Anderson were both injured, while Chris McDonald was suspended and missed his first game of the season. Goalkeeper Tom Flynn, who played four games for the club last season, was signed from Durham City less than 24 hours before kick-off and went straight into the side. But he will not have enjoyed the opening minutes of his return debut. He was left grasping at air less than seven minutes into the game when David Palmer glanced a header just beyond the keeper’s reach and into the corner of the net. A lack of concentration at the back allowed Palmer space inside the six-yard box after the opportunity was set up by a perfectly delivered ball from Kerr. The former Bay star, who spent ten years at the club, was the architect of countless similar goals when wearing a blue and white shirt, and on his return to Hillheads demonstrated his accuracy in ball distribution with a commanding midfield performance. Another former Whitley man, Darren Reay, set up the second goal just seven minutes later with a low cross from the right. Paul Gardiner got ahead of the home defence to poke the ball home just ahead of the diving Flynn. Whitley’s first attacking move of note came with 18 minutes on the clock when Callum Munro’s cross was headed straight at keeper Shaun Newbrook by Adam Shanks. Eight minutes later a header from Josh Day was also easily saved. Back at the other end, Flynn saved from another ex-Bay man, Robbie Bird, before an effort from David Paul crashed off the bar and Flynn palmed the rebound away from danger. Ash Davis was not making the same impact as in his previous two games but nine minutes from the interval he drove in a powerful shot that took a deflection and flew past the post for a corner. At half-time Scott Prosser replaced Munro, who had struggled on the left side of the defence where he had been filling in for McDonald. Despite a change of shape at the back, the second half brought only a slight improvement for Whitley, making it a disappointing afternoon for the home fans who were witnessing their first Saturday game since before Christmas. Alex Kempster battled his way past three defenders but when he played the ball forward, Newbrook got in ahead of Davis and the chance was gone. Seaham might have put the game beyond Whitley after 65 minutes when Bird broke clear on goal but Flynn came to the rescue, racing out of goal and getting a vital hand on the ball, pushing it just wide. Shortly afterwards, Prosser had a good chance for Whitley but could only get his knee to Craig McFarlane’s cross and the ball flashed inches wide of the far post. The visitors defended by launching long balls downfield and hoping the pace of their front men would catch out the Bay defence but were more effective when they made use of Kerr’s vision in midfield. With 15 minutes left, Kerr’s tantalising cross from out on the right looked as if it might creep into the net, but Flynn was alert to the danger and pushed the ball over the bar. Whitley kept battling away but there was no fluency to their play and they too easily conceded possession. Newbrook was doing his best to slow the game down and his delaying tactics tested the patience of the home fans and eventually that of the match officials, with referee Helen Byrne cautioning the Seaham keeper for his time wasting in the closing stages. In the end, Whitley could have no complaints about the final score on a day they will not wish to remember. Whitley Bay: T Flynn, McFarlane, Munro (Prosser 46), R Flynn, Day (Youldon 77), Gibson, Haley, Fowler, Shanks (Anderson 81), Davis, Kempster. Subs not used: Gladstone, Laws.